I recently discovered something called Slow TV. It's a broadcast from Norway. It's more like a marathon of binge watching. From what I understand, it is live TV. I'll watch some or all of the knitting show today (while I'm knitting a sweater) and then I'll see if it's still available on another day and if it's the same show. ...to the one that I've just started watching, National Knitting Evening. I found Slow TV on Canadian Netflix. From the little I've seen so far, my first impression is that it's relaxing, especially if you're knitting while you watch. The show is in Norwegian with English subtitles and is almost 4 hours long. It's a nice break from all the politics that are on TV these days and shows where it seems that all people do is yell and scream. It's like background music, or story where you don't need to keep track of the plot. Off to watch. Let me know what you think of it. -- About half an hour into the show: It is slow, but it is also very interesting. The knitters are planning to knit for/yarn bomb a beautiful Harley Davidson motorcycle. 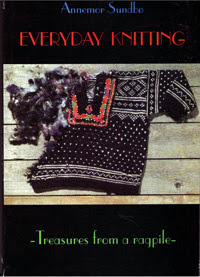 There has been a short video on how to cast on stitches and an interview with Annemor Sundbø who has written a number of books such as "Everyday Knitting: Treasures From a Ragpile". -- After one hour: This show is pleasantly more than I expected. The second half hour shares some of the rich history of Norwegian knitting, there is another short technique video, show and tell projects, an interview with a woman who has created a business for herself by finishing other's UFOs (unfinished objects) and a challenge. A sheep was brought in and it will be shorn, the fleece prepared and turned over to spinners and then knitters are going to make a sweater. They are trying to break the record of about 4 hours. Since this show is just under 4 hours long I wonder if I'll see the results. I understand that the program is many hours longer when shown in Norway. I'm going to pause the show now and hope that it will still be available when I come back to it later on. My first impression: this is my idea of a reality show. It is real. It's also better than I was expecting. When I first heard about it I thought I would be watching people knitting for several hours, but there's a lot more to it. By the way, I think that when it was said that it would be live, they mean that it was filmed live and if anything went wrong, it wasn't edited out. I was able to pause the show and come back to it several hours later. 8/8/16 Update: I've now watched the entire four hours and I only have one complaint. At the end of the 4 hours, the "Evening" show, ended. However, there is another "Night" show and that's the one that has the attempt to break the Guiness Book of Records. I looked online and found the final result, which I won't share here. No spoilers from me!